Video Marketing over social media has evolved at a very high level in past few years, with the introduction of Facebook live, Tweeter Live, Instagram Live apart from YouTube has transformed the entire advertisement Industry. The art of storytelling is one another most popular strategy under video marketing, and it has been widely accepted in Higher Education. The limitation has been drawn with regards to ideas and resources. The videos are mostly limited to course promotion, institution promotion etc, but the horizon of stories is way beyond that. Students are mostly looking at the quality time they are going to spend in a chosen institute or University, would it worth investing and getting the right career support from Institute they have chosen. Thereby, it becomes a necessity for an academic institution to adopt digital disruption to create the brand, reach to the audience and achieve the objectives. Creating a brand image for Sharda university to a global audience. Promoting the events and activities at University. Create an engaging video story to promote the diversified culture, unique learning methods, campus life, hostel life etc. Promotion of scholarship program especially for the female candidate. 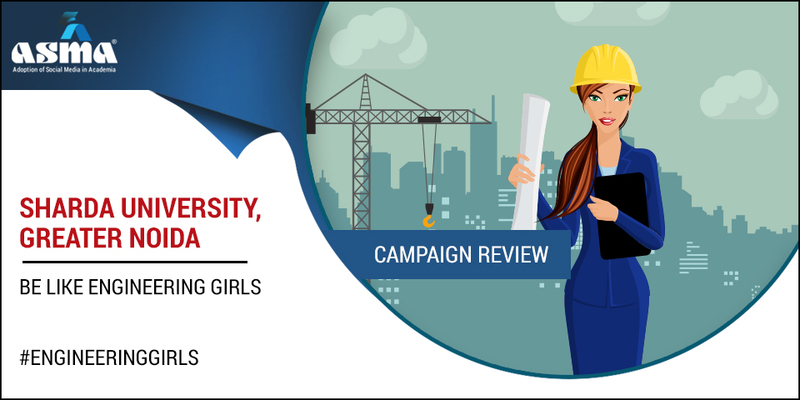 Run the campaign to highlight the benefits of studying at Sharda University, and why it is best among other universities. Created social media buzz about new web series over Facebook and Twitter. Created a web series “Engineering Girls” and share it over YouTube in association with Timeliner. Post about the launch of a teaser on twitter handling, engaging audience with retweets and comments. Influencing Marketing strategy to reach a large number of aspirants. In the digital age, with the advancement in telecommunication, internet, and improvement in video technology, people have started consuming and sharing the video content at a very large scale. The most popular forms of online video content are entertainment, inspirational and news. Sharda University adopted the video marketing strategy in a profound manner to Promote and increase the brand awareness about the university and make presence globally. The series was based on student journey from getting admission, celebrating joyful time at campus, focusing on career, learning-rich knowledge, facing day to day challenges, getting administrative supports to creating unforgettable memories. Created social media waves about web series teaser, experiencing the life of engineering girl. The pre-event promotional strategy contains the launch of web series teaser on Twitter. Increase the engagement of the class by tweeting about the stories. Tweet about the life of engineering girl, and how campus life makes it more special them. With more than 1.1 Million likes over Facebook, engaging the audience over Facebook was directed rightly. The videos post got a very high engagement rate in terms of likes, shares, reach, impressions, views, and comment. Post related to 50% Fee waiver for Female candidate. Post related to assured up to 80% scholarships, thereby increasing the overall number of applications. Web-series were promoted by YouTube Channel Timeliners, series was top trending stories over YouTube. Published five episodes on different themes, connecting the overall student’s journey in Sharda University. Promoting the Sharda Launchpad, and scholarship facility provided by the university for bright students. ASMA is a research initiative, it empowers academic institutes to optimize the usage of social media tools in achieving multiple objectives of institution building. © 2019 ASMA. All Rights Reserved.